Carbon deposits build up over time creating obstructions and contamination of the engine internals, filters and sensor. This contamination can result in increased fuel consumption poor emissions, reduced performance, engine management lights to appear, and even turbo failure – at worst they can cause engine failure often requiring costly repair. Did you know that only 25% of the fuel that is injected into the engine is used to generate performance from the engine! The remaining 75% is wasted – generating heat, highly contaminant gases and carbon residues. Turbopacs Ltd in Durham has added what we believe is the Ultimate Engine Detox to its range of services with the introduction of a fantastic Hydrogen Carbon Removal system, providing a complete engine clean for vehicles with its HydroFlow treatment. So what makes this special? 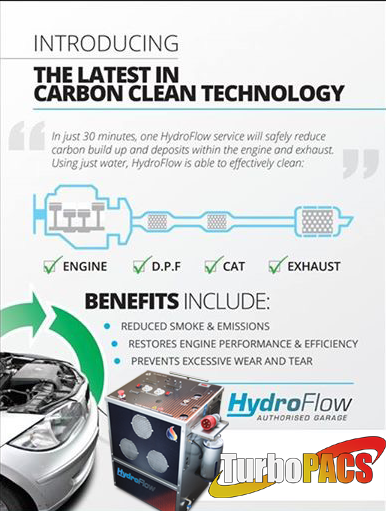 It’s amazing – Hydroflow uses distilled water, to create HHO or Ortho Oxyhydrogen unlike other engine cleaning solutions that rely on carbon based chemicals to remove the carbon deposits from your engine internals, filters and exhaust sensors. Typically these are nothing more than a highly refined fuel either mixed with the fuel in the tank or via a direct introduction to injectors and as such really offer nothing more than you would expect from putting a bottle of additive in your tank. As the miles rack up all vehicles, particularly diesel and high mileage petrol, will suffer from carbon build-up with detrimental effects to economy and reliability increasing. Unburnt fuel deposits, varnishes, stop start driving, poor servicing, along with the current crop of emission devices fitted to vehicles such as DPF filters and EGR valves all conspire to contaminate and congest the internals of your vehicle which also includes sensors and key mechanical components. Un burnt fuels, varnishes and waxes are deposited over the internals, and sensors – It’s really a case of mechanical carbon angina! Engines really don’t like these deposits at all particularly diesels. Signs of carbon build-up can include a smoky exhaust, lumpy idle, flat spots, reduced throttle response, reduced miles per gallon (MPG) and increased emissions (often it can be the difference between an MOT pass and fail.) Dpf warning lights appearing and even reduced performance (limp mode) events. Turbo issues such as sticking waste gates and limp mode events can also appear along with complete turbo failure. With Hydroflow the dirtier a vehicle is, the greater the effect a Hydroflow Carbon Clean session can have in restoring the vehicle’s lost performance and efficiency. We have found this process to be so effective at removing carbon build up that we will Guarantee to decarbonize your Dpf allowing it to regenerate itself provided all the vehicles sensors are functioning as required. Hydro Flow’s chemical free cleaning process is proven to help reduce emissions and smoke for both Petrol and Diesel vehicles and is a must have treatment for cars, vans and even motorbikes. It drastically reduces carbon deposits and costs for cleaning sessions start at only £70 plus vat for bikes and £125 plus vat for cars. Owners typically report immediately noticeable improvements, quieter, smoother, improved response and power. It’s a simple and safe process and requires no dismantling of engine parts or the use of harmful chemical products. We also recommended using the Hydroflow Engine Carbon Cleansing process as part of your vehicle’s regular maintenance and service schedule. PREVENTATIVE MAINTAINENCE at its best. So how does Hydroflow remove carbon deposits? A strong electric current splits the water molecule (H2O) into its component atoms producing highly charged particles of hydrogen and oxygen, or ortho-oxyhydrogen (HHO) which is H2O2 sometimes referred to as Brownes Gas. The process to do this is technically know as a pyrolysis – which is thermo chemical decomposition of organic material at elevated temperatures) which burns off, disintegrates, and removes carbon deposits. HHO, along with increased oxygen levels, raises the combustion temperature within the engine making it possible for a chemical reaction to occur that burns off and disintegrates the carbon deposits. There are NO carbon deposits or fuel additives with this solution making it the ultimate DETOX for your engine. HHO introduced into an engine increases the flame front or flammability range and combustible ratio up to 5-8 times what is found in a normal petrol or diesel engine. Introducing even a small amount of HHO into an engines air/fuel mixture will make the combustion far more stable significantly improving the ignition of the fuel within the combustion chamber resulting in a bigger, more efficient burn and strips away carbon deposits layer by layer. Fuel molecules are really quiet big with lots of space between them. The HHO fills the gaps and as you might well imagine Hydrogen is extremely combustible, and some would say the ultimate fuel, and when the combustion process occurs it strips the carbon inside your engine away. A stratified (rippled) combustion breaks down the carbon layer by layer into fine powder from the outside in, until finally it is atomized and combusted into very fine particles. During a 1 hour cleansing session with our deep clean option we pass 1840 litres of HHO gas through your engine!! Bare this in mind – Regular preventive Hydroflow Carbon Cleaning can restore and extend the serviceable life of engine parts rather than replacing them, thereby saving on costly parts, such as a new turbocharger (£895 – £2850), catalytic converters (£600 – £2.000), DPF Filters (£600 – £3000 plus !) or EGR valve (£370 – £500). Feedback after a Hydroflow cleaning session on a Renault Traffic 2.0 115 Dci with no faults.